Antibacterial soap, use-anywhere bleach spray, chlorinated water, antibiotics, not to mention the horror we express if the baby eats some dirt… we are obviously a germophobic society. So you may ask why we would possibly want to eat fermented foods—foods alive with, yes, bacteria. Fermented food has been enjoyed for thousands of years. There is evidence of wine-making dating back to eight thousand years ago in the Caucasus area of Georgia and seven-thousand-year-old old wine jars have been discovered in Iran. The Babylonians were fermenting beverages 7,000 years ago, the Egyptians 5,200 years ago, the ancient Mexicans 4,000 years ago, and the Sudanese 3,500 years ago. Furthermore, some of these cultures were fermenting bread and milk. So this way of eating is not a new thing. Our culture is working hard to sterilize our environment as much as possible—we spray bleach and chlorine all over our houses, we keep our children indoors for much of their time, we cover our bodies with harsh, bacteria-killing beauty supplies, our first defense in sickness is to “kill off everything” and we sterilize our food through irradiation, heating, pasteurizing, packaging, and chemicals. But what about the “good guy bacteria”—can we live without it? 1. Fermented foods and drinks bring beneficial bacteria into your digestive system. This, in turn, helps to improve digestion, bowel health, and overall immunity. Healthy bacteria boosts your immune system in three ways – it “takes up space” in your gut, which crowds out the bad bacteria, it “talks” to the immune system’s lymph nodes and helps the lymph nodes know which bacteria are invaders, and it aids in the growth of important immune system organs such as the thymus (www.marksdailyapple.com). This improvement of the immune system can help with ailments such as asthma, yeast infections, and eczema and scientists are beginning to suspect that an unhealthy gut is the root problem of nearly all illnesses. 2. Fermented foods help you to better digest, absorb, and use the nutrients in your food. Even if you are eating real, whole foods, if your body is unable to absorb those nutrients properly, you won’t receive the most benefit from that good food. These enzymes are also what allow people to eat some foods that are normally intolerable; for instance, some lactose intolerant individuals can eat fermented dairy foods such as yogurt and kefir and some celiacs can eat traditional sourdough. But more about that later. 3. Higher levels of vitamins and nutrients are found in fermented foods as compared to their “regular” counterparts. For example, fermented dairy products were found to have higher levels of folic acid (particularly good for women in their childbearing years), biotin, riboflavin, and B vitamins such as pyroxidine. 4. Fermented foods may also help prevent depression, according to the blog www.refinedminds.com. Serotonin is a neurotransmitter that is closely linked to moods and a deficiency in this neurotransmitter may produce depression. Five percent of serotonin is found in the brain but the other 95 percent is found in the intestines—so a healthy gut flora can translate into a healthy amount of serotonin which, in turn, can translate into feeling good! 5. A point near-and-dear to most homesteaders—fermented foods are easy on the wallet! First, better absorption of your food means you’re getting more “bang for your buck” every time you eat. Secondly, fermenting your own food is a cheap hobby; you can begin fermenting some foods with some homemade whey, salt, veggies, and a mason jar. Fermented foods are also such “super-foods” that you may spend less on supplements, medications, and doctor visits—always a good thing! 6. Fermentation provides an easy way to preserve food. Bountiful produce can be turned into homemade pickles, sauerkraut, and salsa that lasts for months. Excess milk can be turned into yogurt or kefir. And lacto-fermentation retains more nutrients than traditional canning. 7. And, finally, fermented foods just taste good. Just think, sauerkraut on hot dogs, buttermilk pancakes, tortilla chips with salsa, and stinky cheese with a good wine. Eating these foods is not a hardship, that’s for sure! Let’s begin our look at our first fermented food with an interesting, and true, story. Kefir is one of the oldest fermented milk products and is similar to yogurt. Legend has it that Mohammed gave kefir to the people of the northern parts of the Caucasian Mountains and thus they became known as “Grains of the Prophet”. Since they were so special, the grains and how to prepare them were guarded very carefully; Marco Polo mentions kefir and its “magical properties” but the grains were not available to outsiders. Knowledge of kefir almost vanished until a rumor spread that it could be used in the treatment of tuberculosis and intestinal and stomach disorders. Russian doctors decided they had to have some kefir. So they hired the Blandov brothers; they, in turn, hired a beautiful young woman named Irina Sakharova. Her mission was to visit a local prince, Bek-Mirza Barchorov, and convince him to give her some grains. The prince didn’t want to be in trouble for giving away the grains but neither did he want to lose Irina. As she and her entourage were traveling back home, the prince had Irina kidnapped, and, in accordance with the local custom of stealing brides, told Irina she must marry him. She was saved in a rescue mission and the Tzar ordered Prince Barchorov to give Irina ten pounds of kefir grains in compensation. Thanks to Irina Sakharova, kefir is the number one fermented milk drink in Russia and has made its way to our shores. While kefir is similar to yogurt, it contains five times more friendly bacteria and it has some different types that are not found in yogurt, such as the species Lactobacillus acetobacter, caucasus, and, Leucononstoc. Kefir also helps colonize the intestinal tract with friendly bacteria whereas yogurt contains more transient beneficial bacteria. Finally, kefir has a smaller size curd and this makes it easier to digest for babies, the elderly, and the ill.
Place kefir grains in a jar. 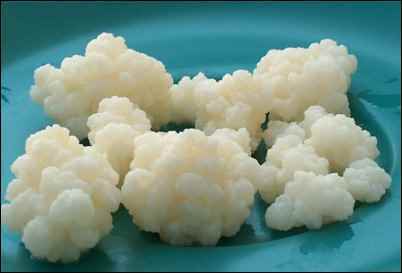 You can order kefir grains online but many kefir makers will gladly share some with you. It is good to establish a “kefir community”; if you mess up your grains somehow, you will easily be able to get another supply. Add the fresh milk. There is no need to do anything to the milk. Lightly cover the jar. Do allow some space at the top of the kefir milk and do allow for some oxygen to reach the kefir and feed the grains. I just use a cloth napkin and a rubber band. Place jar in a room that is about 65–75 degrees and away from direct sunlight. This range of temperatures promote the fermentation of the 30 different bacteria and 25 different yeasts found in the kefir. Leave for 1-3 days. Kefir is mild tasting after 12 hours, tart at 24 hours, and “zesty” at 48 hours. My kefir is consumed by kids, so I only leave it overnight so they don’t suspect it in their smoothies. Separate the kefir milk from the kefir grains. Using a plastic strainer, pour out the mixture into the cup. It is important to use plastic or glass. Kefir is acidic and can react with reactive metals such as copper, brass, and aluminum. The remaining solids caught by the strainer should be used for your next batch of kefir making. Place these grains in a glass container, cover with some milk, and place in the refrigerator if you’re not ready to make more kefir. If you find you have too much kefir and you can’t give any away, the grains are healthy food and can be eaten by themselves. The liquid you strained into the cup is now your kefir. You can drink this right away, refrigerate it for later or use it for some other recipes such as kefir cheese, bread, smoothies, or soups. Sourdough, one of the oldest leavened breads, dates back to around 4,000 BC in Egypt. Probably by accident, some beneficial bacteria fell into some bread and the baker noticed that, while the bread did not rise as much, it had a light texture and a good taste. Once bakers figured out what was happening, they would commonly leaven bread by adding a piece of dough from each day’s baking to the next batch. It is said that sourdough starters were carried in Columbus’ ships and by the 1800s, they were of great importance for the gold miners and pioneers making their way west. Having a sourdough starter allowed the prospectors and pioneers to make bread or biscuits whenever necessary, without a trip to town for yeast. The leavener was so important that the miners slept with the starters during cold weather to keep it from freezing. Many cabins had a tin for the “sponge” hanging over the woodstove. The starters were passed to friends and to family and by 1849, sourdough was famous for its unique aroma and tart taste. So why sourdough over “regular bread”? Because of its friendly bacteria, sourdough is easier to digest, even for gluten-sensitive people. First, the bacteria help your gut absorb nutrients more efficient. Secondly, sourdough contains less phytic acid than most grain products; phytic acid robs your body of nutrients and blocks nutrient absorption. In addition, sourdough produces protein enzymes that break down gluten-forming proteins such as albumin and glutalin—these proteins cause most gluten intolerance. Finally, diabetics should be able to tolerate sourdough better because it depletes the damaged starch in bread. If you can’t find a source for sourdough starter, you can make your own. Mix together in a glass or stainless steel bowl 2 cups of flour (use whichever type of flour you plan on baking bread with—you can’t use the starter in different types of flour) and 1-1/2 cups water. Cover with cheese cloth and place outside for 4-5 days. Be sure to stir a couple of times a day. After 2-3 days it should begin to bubble. When it does, feed the starter 3/4 cup water and 1 cup flour and stir well again. Let it continue to ferment. After 4-5 days it should produce about an inch of foam. If it doesn’t rise or smells bad, throw it out and start over in another spot. When the foam is formed, stir the mixture well and place one cup of it into a glass or plastic container. Feed it 3/4 cup water and 1 cup flour as before. 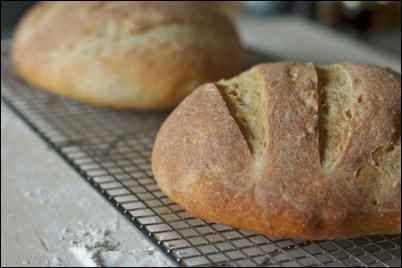 Use the remainder to make bread or discard. Let the storage culture sit out another 2 or 3 hours then place it in the refrigerator until ready to use. Each time you use it, replace 3/4 cup filtered water and 1 cup flour. This will make a well hydrated, thick storage leaven. Let the culture sit out for at least 2 hours before replacing the lid and returning to the refrigerator. Revitalize it at least once a week by either using a cup of it or removing a cup and throwing it away. Feed it as above: 3/4 cup of water and 1 cup of flour. Add ingredients in order to the bowl, kneading to form a smooth dough. Let rise until double. This can be four to seven hours depending on the warmth of the kitchen and the strength of the starter. Then punch down and shape into a loaf and place the loaf on a lightly greased or parchment-lined baking sheet. Cover and let rise until very puffy, about two hours or until doubled. Towards the end of the rising time, preheat the oven to 425. Make two fairly deep diagonal slashes in the bread. Bake until it’s very deep golden brown; about 25 to 30 minutes. Remove from oven and cool on a rack. Mix all the ingredients in a bowl and pound with a fist or wooden pounder to release juices. 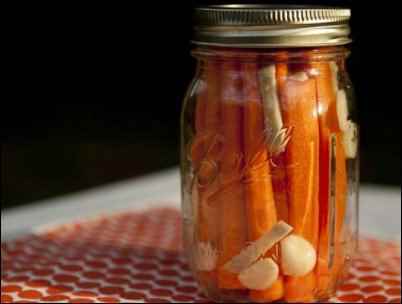 Pack into a wide-mouth quart size jar and press down until juices cover the carrots. Cover tightly and leave them at room temperature for three days, but if your carrots bubble fiercely, let off the pressure several times per day to prevent the jars from exploding. Leave more than a 1-inch space between the carrots and lid to avoid explosion, also. Lactobacillus, bacteria that produces the natural preservative lactic acid, are present on the surface of all living things. It is especially prevalent in whey, which can be obtained from yogurt with live cultures. The salt is added to inhibit unwanted organisms just until enough lactic acid has formed to preserve the vegetables. This is why less salt can be used if the fermentation process is jump-started with whey. Wearing gloves, cut open the chilies and discard the stems and seeds. Set aside. If using fresh tomatoes, peel and deseed them: Fill a large saucepan halfway with water, set on high heat and bring to a boil. Carefully set tomatoes in saucepan and let sit for 5-10 seconds, then remove with a slotted spoon or tongs. Cool and peel. Cut tomatoes in half and gently squeeze out the seeds, or scoop out with a spoon, and discard. Set aside. Peel and quarter the onion and peel and smash or crush the garlic. If using fresh herbs, rinse, dry and chop them, discarding the stems. Place the peppers, tomatoes, onion, garlic, and optional herbs into the food processor or dice by hand. Squeeze the 2 lemons or 3 limes and add the juice. Add the sea salt and whey. Pulse several times (more or less for desired consistency). Transfer to quart-sized mason jar. Add a little filtered water if necessary (if you like it more liquid and it’s too chunky). If you add water, put the lid on and shake it up so it’s incorporated. Make sure to leave at least an inch of space from the top of the jar. Cover and keep at room temperature for 2-3 days before transferring to the fridge. Salsa will keep for weeks or months in fridge. According to Carolyn Bohach, a microbiologist at the University of Idaho, there are 10 times more bacterial cells in your body than human cells. All that bacteria would fill a half-gallon jug. Better make that colony beneficial bacteria—start eating some fermented food today!